The legendary agent is finally back in Hitman Absolution. It’s been a long time coming and Agent 47 is now on the run, wanted by police. The newly released game play clip gives you a good idea of what to expect. Plenty of crawling around in the dark and a few silent take downs. You also seem to have this ability where you can see enemies through walls and see their destination, a bit like splinter cell. Looks like a very useful tool due to the sheer number of police to get past in this part of the game. 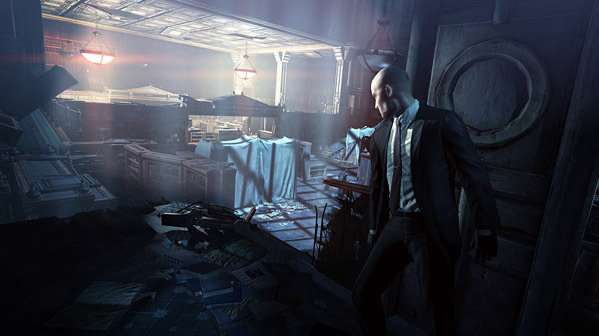 I know there has been a bit of uproar about the style of game play here, but in truth Hitman games have always historically allowed you to play the game however you want, you want to be the stealthy type go ahead, or you can go guns blazing if you’re really feeling brave. One of the things that has gripped me the most about this clip, is how the npcs are reacting to each other and your events. Take out a cop while he’s mid conversation with another cop with his back turned and you hear him call out, asking why his partner has suddenly gone quiet. The npc’s always seem to have a goal, always moving forward. This will make the traditional approach of learning patrol patterns that much more difficult. I for one am looking forward to stepping into the shoes of the legendary Agent 47 again. 20 something gamer. Love my racers and RPGs. Got a thing for horror games, but don't like horror films. Strange, but true. Toy Soldiers: Cold War Competition! Awesome New Fifa 12 Trailer! Fallout 4 – What makes you S.P.E.C.I.A.L? Copyright © 2013 GamEvolution. All Rights Reserved.